Strong doses may result in fatal heart complications. 10-Methoxyibogamine (commonly known as ibogaine) is a naturally occurring psychedelic substance of the tryptamine class. Ibogaine is an indole alkaloid found in some plants of the Apocynaceae family such as Tabernanthe iboga, Voacanga africana and Tabernaemontana undulata. In West Central Africa, low dosages of Tabernanthe iboga extracts have been used by indigenous people against fatigue, hunger and thirst. Higher dosages capable of inducing visionary states are used for initiation rituals during religious ceremonies. Ibogaine's medical history in the West began in the early 1900s when it was indicated for use as a neuromuscular stimulant. In the 1940s and 1950s, its suitability as potential cardiovascular drug was studied. Later in the 1960s, the substance received much attention because of its potential applicability as an anti-addiction medication. The pharmacology of ibogaine is complex and poorly understood. While largely behaving as a serotonergic psychedelic, ibogaine interacts with numerous brain systems including transporters, opioid receptors, sigma receptors, glutamate receptors, and nicotinic receptors. Ibogaine’s complex pharmacology entails a significant potential to generate adverse effects, particularly on the cardiovascular system. Its use has been associated with at least 12 deaths since 1990. Ibogaine is not currently approved for any medical uses in the United States. Preliminary research in animals indicates that it could potentially be used for treatment of addiction; however, there is a lack of non-anecdotal data in humans. Although not licensed as therapeutic drug and despite safety concerns, ibogaine is currently used as an anti-addiction medication in dozens of clinics worldwide. The Iboga tree is the central pillar of the Bwiti religion practiced in West-Central Africa, mainly Gabon, Cameroon, and the Republic of the Congo, which uses the alkaloid-containing roots of the plant for its psychoactive properties in a number of ceremonies. Ibogaine is also used by indigenous peoples in low doses to combat fatigue, hunger, and thirst. Research of ibogaine started in late 19th century. A published description of the ceremonial use of T. iboga in Gabon appears in 1885. Ibogaine was first extracted and crystallized from the T. iboga root in 1901. The total synthesis of ibogaine was described in 1956 and structural elucidation by X-ray crystallography was completed in 1960. Ibogaine, or 12-methoxyibogamine, is an indole alkaloid molecule of the tryptamine chemical class. Tryptamines share a core structure composed of a bicyclic indole heterocycle attached at R3 to an amino group via an ethyl side chain. While ibogaine contains a tryptamine backbone, the structure features substitutions distinct from other hallucinogenic tryptamines. Ibogaine is substituted at R10 of its structure with a methoxy group. The location of this substitution is identical to other R5 substituted tryptamines, notably 5-MeO-DMT. The traditional amino attached ethyl chain of tryptamine is incorporated into a seven member nitrogenous azepine ring. The azepine ring is fused to three interlocked cyclohexane rings, attached at the integrated tryptamine nitrogen of azepine and two carbons over. Attached to the fusion of cyclohexane rings is an ethyl chain at R7. 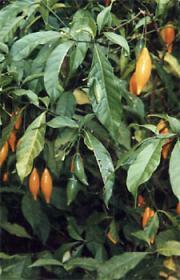 Ibogaine is obtained either by extraction from the iboga plant or by semi-synthesis from the precursor compound voacangine, another plant alkaloid. Ibogaine is believed to produce its psychedelic effects from its binding efficacy at the 5-HT2A receptor. However, the role of these interactions and how they result in the psychedelic experience continues to remain elusive. Ibogaine is rapidly metabolized in the human body into noribogaine. Noribogaine acts as a serotonin reuptake inhibitor. It also acts as a moderate κ-opioid receptor agonist and weak µ-opioid receptor agonist or weak partial agonist. It is possible that the action of ibogaine at the kappa opioid receptor may contribute significantly to the psychoactive effects. Salvia divinorum is another plant recognized for its strong hallucinogenic properties; it contains the chemical salvinorin A which is also a highly selective kappa opioid agonist. Both ibogaine and noribogaine have a plasma half-life of around two hours in rats, although the half-life of noribogaine is slightly longer than that of the parent compound. It is proposed that ibogaine is deposited in fat and metabolized into noribogaine as it is released. After ibogaine ingestion in humans, noribogaine shows higher plasma levels than ibogaine and is detected for a longer period than ibogaine. Noribogaine is also more potent than ibogaine in rat drug discrimination assays when tested for the subjective effects of ibogaine. Ibogaine also has activity as an NMDA receptor antagonist. Stimulation - This effect is exclusively produced at low doses. Abnormal heartbeat - Abnormal heartbeat is an uncommon effect and typically only occurs when the individual has preexisting health concerns relating to the cardiovascular system. This effect usually only comes about in high dosages due to inhibition of the hERG channels in the heart which affect repolarization (relaxing of the atria) leading to a change in cardiac activity. It is strongly recommended that one go through a physical health evaluation or screening prior to using this substance. Spatial disorientation - This effect differs from most other dissociatives in that the user is still fairly lucid but physically feels disoriented, off-balance and dizzy. Despite typically being classed as a psychedelic tryptamine, this compound also presents dissociative-like effects due to its properties as an NMDA receptor antagonist. Tracers - This particular visual effect is more intense and more consistent than with any commonly used psychedelic. Analysis enhancement - This effect is consistent in its manifestation and introspection dominant. Wakefulness - This effect is due to its powerful stimulant and hallucinogenic effects that can last well over 24 hours, this is often capable of keeping the user awake for up to several days with traditional doses. Rejuvenation - This effect is not usually felt as immediately as it is with ayahuasca or mushrooms, and can often take 2 to 4 full nights of sleep to become fully manifested. Anecdotally, these components are generally considered to be most consistent with the naturally-occurring entheogenic tryptamines such as ayahuasca, ibogaine and psilocybin. Ibiogaine can be found within a variety of natural sources which are primarily found on the African continent. The most common of these are listed below. Research suggests that ibogaine may be useful in treating dependence on other substances such as alcohol, methamphetamine, and nicotine and may affect compulsive behavioral patterns not involving substance abuse or chemical dependence. Researchers note that there remains a "need for systematic investigation in a conventional clinical research setting." Many users of ibogaine report experiencing visual phenomena during a waking dream state, such as instructive replays of life events that led to their addiction, while others report therapeutic shamanic visions that help them conquer the fears and negative emotions that might drive their addiction. It is proposed that intensive counseling, therapy and aftercare during the interruption period following treatment is of significant value. Some individuals require a second or third treatment session with ibogaine over the course of the next 12 to 18 months. A minority of individuals relapse completely into opiate addiction within days or weeks. A comprehensive article on the subject of ibogaine therapy detailing the procedure, effects and aftereffects is found in "Ibogaine in the Treatment of Chemical Dependence Disorders: Clinical Perspectives". Ibogaine has also been reported in multiple small-study cohorts to reduce cravings for methamphetamine. In 2018, a study demonstrated neuroplasticity induced by noribogaine, an active metabolite of ibogaine, and other psychedelics through TrkB, mTOR, and 5-HT2A signaling. Ibogaine has been associated with life-threatening heart complications, such as QT prolongation. It can be taken safely, but only under the supervision of trained medical professionals. Ibogaine is not habit-forming and the desire to use it can actually decrease with regular consumption. Like with most psychedelics it is most often thought to be self-regulating. Ibogaine is unregulated and unlicensed in most countries. Some exceptions are listed below. Brazil: On January 14, 2016, Ibogaine was legalized for prescription use. Canada: As of 2009, ibogaine is unregulated. Germany: Ibogaine is unregulated, but for medical use it can be regulated by the pharmacy rules (AMG). Mexico: As of 2009, ibogaine is unregulated. New Zealand: Ibogaine was gazetted in 2009 as a non-approved prescription medicine. Norway: Ibogaine is illegal (as are all tryptamine derivatives). Sweden: Ibogaine is schedule I. United States: Ibogaine is classified as a Schedule I drug, and is not currently approved for addiction treatment (or any other therapeutic use) because of its hallucinogenic, cardiovascular and possibly neurotoxic side effects, as well as the scarcity of safety and efficacy data in human subjects. Mačiulaitis, R., Kontrimavičiūtė, V., Bressolle, F. M. M., & Briedis, V. (2008). Ibogaine, an anti-addictive drug: pharmacology and time to go further in development. A narrative review. Human & experimental toxicology, 27(3), 181-194. https://doi.org/10.1177/0960327107087802. ↑ Koenig, X., & Hilber, K. (2015). The anti-addiction drug ibogaine and the heart: a delicate relation. Molecules, 20(2), 2208-2228. ↑ Alper, K.R. Ibogaine: A review. Alkaloids Chem. Biol. 2001, 56, 1–38. ↑ Schneider, J.A. ; Rinehart, R.K. Analysis of the cardiovascular action of ibogaine hydrochlorid. Arch. Int. Pharmacodyn. Ther. 1957, 110, 92–102. ↑ Mačiulaitis, R., Kontrimavičiūtė, V., Bressolle, F. M. M., & Briedis, V. (2008). Ibogaine, an anti-addictive drug: pharmacology and time to go further in development. A narrative review. Human & Experimental Toxicology, 27(3), 181-194. https://doi.org/10.1177/0960327107087802. ↑ 6.0 6.1 6.2 6.3 6.4 Koenig, Xaver; Hilber, Karlheinz (2015). "The Anti-Addiction Drug Ibogaine and the Heart: A Delicate Relation". Molecules. 20 (2): 2208–2228. doi:10.3390/molecules20022208. ISSN 1420-3049. ↑ 7.0 7.1 Mačiulaitis, R., Kontrimavičiūtė, V., Bressolle, F. M. M., & Briedis, V. (2008). Ibogaine, an anti-addictive drug: pharmacology and time to go further in development. A narrative review. Human & experimental toxicology, 27(3), 181-194. ↑ Giannini, A. James (1997). Drugs of Abuse (2 ed.). Practice Management Information Corporation. ISBN 1-57066-053-0. ↑ Ly, Calvin; Greb, Alexandra C.; Cameron, Lindsay P.; Wong, Jonathan M.; Barragan, Eden V.; Wilson, Paige C.; Burbach, Kyle F.; Soltanzadeh Zarandi, Sina; Sood, Alexander; Paddy, Michael R.; Duim, Whitney C.; Dennis, Megan Y.; McAllister, A. Kimberley; Ori-McKenney, Kassandra M.; Gray, John A.; Olson, David E. (2018). "Psychedelics Promote Structural and Functional Neural Plasticity". Cell Reports. 23 (11): 3170–3182. doi:10.1016/j.celrep.2018.05.022. ISSN 2211-1247. This page was last modified on 21 March 2019, at 14:17.